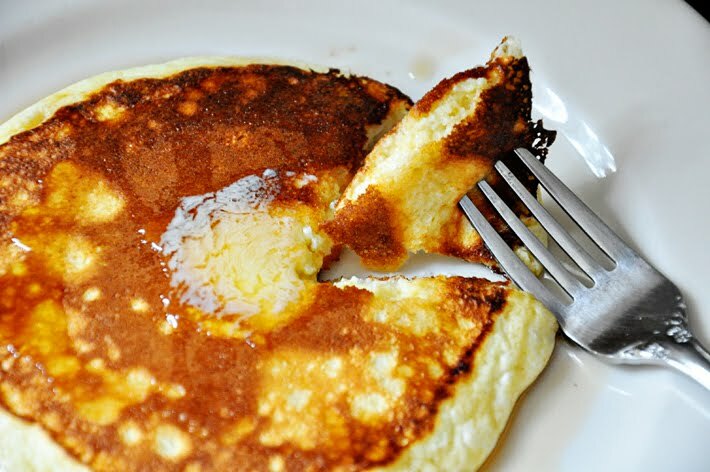 The Parsley Thief adapted this recipe for Ricotta Pancakes from Apartment Therapy’s Kitchn earlier this summer. Cheese and maple syrup often go well together as do pancakes (of course!) and maple syrup, so you can imagine how delicious these are. By all means, do not just take our word for it – make some soon, today if possible! Drain the ricotta in a sieve, set over a bowl, for 30 minutes, to drain out excess moisture. In a mixing bowl, whisk the flour, baking powder, sugar & salt. In another bowl, whisk the ricotta, milk & egg yolks. Add the egg whites to the bowl of an electric mixer, fitted with the whisk attachment. Beat until stiff. Add the dry ingredients to the wet ingredients & stir to combine. Fold in the egg whites, until just incorporated. It’s okay to have lumps. Heat some butter in a skillet, or griddle, over medium heat. Ladle the batter in a 1/3 cup measure & cook the for 4 minutes a side, or until golden brown. Serve with some real maple syrup. Beautiful photographs courtesy of The Parsley Thief.